DERWENT Valley residents and visitors can learn how to become bushfire-ready at today's Tasmania Fire Service expo in the carpark at the New Norfolk Woolworths supermarket from 10am-5pm. "As we move into the warmer months many Tasmanian communities have been participating in the Tasmania Fire Service (TFS) Bushfire-Ready Neighbourhoods (BRN) program," TFS community development co-ordinator Peter Middleton said. "The BRN program recognises that individuals, communities and government all share the responsibility to prevent, prepare, respond and recover from bushfires," Mr Middleton said. Tasmania is one of the most bushfire-prone places in the world and now is the time for people to prepare their properties and get bushfire ready. Mr Middleton said Bushfire-Ready Neighbourhood events were a great way for communities to learn how to help each other and themselves. Attendees will learn how to write a bushfire survival plan, which helps prepare their homes and teaches what to do if a bushfire approaches. "Writing and practicing a bushfire survival plan will help people think through the actions logically, give them something to refer to and can help control fear and anxiety if a bushfire breaks out nearby," he said. "Over the past few weeks hundreds of Tasmanians have participated in bushfire ready activities in our communities in Sandford, Dolphin Sands, Collinsvale and Rowella. Bunnings stores state-wide also jumped on board and have held several bushfire ready events. "Our programs really help communities build resilience and prepare for the upcoming bushfire season. Research has found that households that participate in our programs are significantly more prepared which is great news," Mr Middleton said. For more information about the Bushfire Ready Neighbourhood program visit the Tasmania Fire Service website or Facebook page or phone 1800 000 699. "All Tasmanians, regardless of where they live, are encouraged to understand the risks they face and explore options well in advance of the bushfire season," Mr Middleton said. 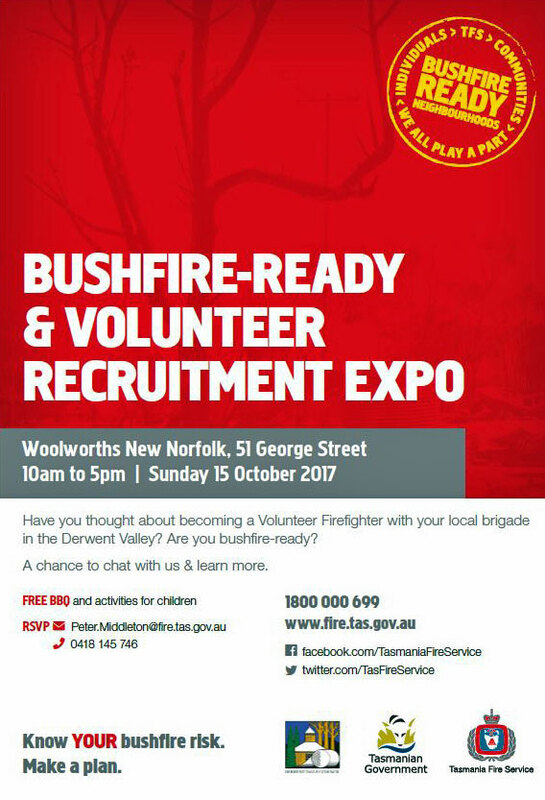 Visitors to today's TFS expo at the Woolworths supermarket carpark in George St, New Norfolk, can also find out about becoming a fire brigade volunteer.